This week was a bank holiday. As I say every bank holiday, bank holidays are weird. I think we managed 15 people. 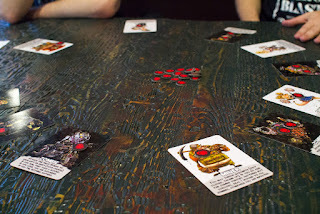 I started off with Mike's new Kickstarter, the boardgamegeek published mini game I Hate Zombies. It's a pretty strange little rock, paper, scissors on steroids style game. I totally won at it but if I'm honest I wasn't surprised, I'm very slightly better than average at rock, paper, scissors and luckily that's all you need. I followed up with a couple of games of Lost Legacy. 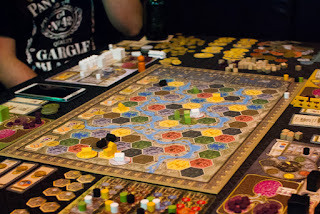 The other tables played Terra Mystica (maybe with the expansion, I saw the box there at least) and Relic. I think both games took them all night, they're both pretty epic games. I played some Liar's Dice or, as some people like to call it, Perudo. Or as I like to call it, Bad Skull And Roses because I would always prefer to be playing Skull and Roses. Afterwards we played Kindom Builder followed by the triumphant return of Takenoko. That game hasn't appeared on a table at IpBoG since the very first meetup. As I left that night Terra Mystica and Relic were still being played, maybe I'll get there next week and they'll still be going on. But probably not.